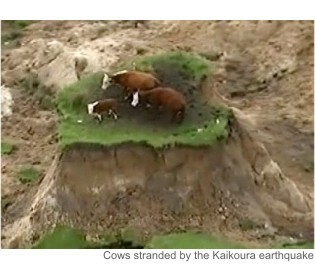 As a result of last week’s 7.8 magnitude earthquake, the Government is considering emergency legislation to get Kaikoura back up and running. After visiting the hard hit region, Prime Minister John Key said, “We can’t leave people high and dry. If we need emergency legislation we’ll pass it”. Any new law would undoubtedly be modelled on the now-repealed Canterbury Earthquake Recovery Authority legislation, which enabled the Government to override a large number of laws including the Resource Management Act (RMA). If special legislation is used to suspend the RMA, it would be the fifth time in recent years that law changes have been needed to over-ride the delays it causes – the first was to get a water plan into the Canterbury region, the second to enable the Auckland Council to finalise its unitary plan, the third to support Christchurch’s rebuild, and the fourth to establish Special Housing Areas to fast-track the re-zoning of land for residential housing. The RMA, New Zealand’s foremost environmental legislation, was the brainchild of former Labour Prime Minister Sir Geoffrey Palmer. It was passed into law by National in 1991, to replace the traditional rules-based approach of the Town and Country Planning Act, with an ‘effects-based’ regime that would allow development, just so long as adverse environmental effects were mitigated. But the escalating costs, red tape, and delays, associated with the RMA have become such an impediment to growth, that when National was elected to Government in 2008, overhauling the law was their priority. A two-phase process was mapped out. The first phase included establishing the Environmental Protection Authority to deal with nationally significant consents within a nine-month timeframe, removing the rules that prevented property owners trimming their own trees, shortening the timeframe for consent processing, and preventing the law being used for anti-competitive purposes. The second phase of reform was to focus on the core problem – the need to rebalance the RMA to take into account economic growth, jobs and exports, as well as environmental effects. This was to be achieved through changes to Sections 6 and 7 of the Act, the purpose and principles. In 2013, when the Environment Minister Amy Adams released a consultation document outlining the reform proposals, changes to Sections 6 and 7 were included. However, she was unable to secure a Parliamentary majority for the Bill, as neither United Future nor the Maori Party, would support economic development being given the same weight in law as environmental protection. With only ACT’s backing, National was one vote short and the reform programme stalled. During the 2014 election, National again campaigned on RMA reform, with rebalancing the Act a priority, and once back in government, they wasted no time in pressing ahead. The Minister stressed the importance of changing Sections 6 and 7 of the Act, so the effects on the environment could be weighed up against the benefits of economic growth and jobs, and he described ten reform proposals. The first was to include the management of significant natural hazards, such as earthquakes, floods, landslides and volcanoes, in the RMA. With around eighty percent of resource consents about urban issues, the second proposal was to recognise the urban environment in the purpose and principles of the Act. The third was to include affordable housing in the Act, since, by constraining land supply, and by prioritising the protection of landscapes and amenity values – without any consideration of the cost, the current law has made the building of affordable housing almost impossible. The fourth proposal was to add the provision of essential infrastructure into the purpose of the Act, to ensure transport, communication, water and energy projects are prioritised. The fifth was to give more protection to private property rights by limiting the degree to which council officials could meddle in people’s lives – and by providing greater discretion for councils to waive the need for resource consents for minor projects. The sixth proposal was to consolidate RMA rules across councils by requiring standardised planning templates. With councils taking on average six years to complete their plans, the seventh reform proposal was to streamline the plan-making process. The eighth was to foster collaborative ways of resolving resource management disputes. The ninth was to strengthen national regulations through a greater use of National Policy Statements and National Environment Standards. And the final proposal was to bring the RMA into the digital age. With the support of ACT, National had a Parliamentary majority and Nick Smith planned to have his Bill drafted and introduced in the first half of the year, with a view to it being passed into law by Christmas. However, nine days after the speech was delivered, National’s Northland MP Mike Sabin resigned, and the Party lost the seat to Winston Peters. As a result, National again needed two extra votes to pass any law through Parliament. With United Future and the Maori Party still opposed to any overhaul of the RMA that included changes to sections 6 and 7, the reforms again stalled. That is until November of last year, when Nick Smith made the surprise announcement that he had tabled the Resource Legislation Amendment Bill in Parliament. The Minister had done a deal with the Maori Party – in return for supporting the Bill to a Select Committee, the crucial changes to sections 6 and 7, which were central to National’s reform programme, had been dropped, and instead, new race-based co-governance powers for the Maori elite had been included. The new Iwi Participation Agreements will require democratically elected councils to seek the approval of unelected tribal representatives in all major decision-making. Even though many councils have more than a dozen iwi claiming an interest in their areas – each will be entitled to set up their own Agreements and be individually consulted. These Agreements will also provide an accelerated pathway for tribal groups to become resource consenting authorities for fresh water and other natural resources. By using the RMA’s Section 33 Transfer of Powers, an iwi can become a full consenting authority, or by using Section 36B, they can become a joint consenting authority with their council. Nick Smith’s controversial Bill attracted almost 1,000 submissions to the Local Government and Environment Select Committee. The concerns raised during public hearings delayed its July report back to Parliament by two-months, then another two months, until Committee Members refused further extensions and the Bill was returned to the House two weeks ago, with no changes at all. Opposition MPs blamed the Minister’s meddling for the shambles. In their submission on the Bill, Ngai Tahu had recommended the inclusion of Mana Whakahono a Rohe. They said they would enable iwi to undertake “the handling of resource consent applications, notification decisions, monitoring and enforcement”. This is quite different from the way Dr Smith described their impact. In other words, these new mechanisms that Nick Smith has included in the RMA will enable race-based vested interests to take over resource consenting from democratically elected councils. That means hapless property owners will not only be forced to consult with councils, but with multiple iwi as well. Instead of streamlining and simplifying the RMA, Nick Smith is about to make it much worse. “Recently, a shop tenancy changed in a modern 17-storey Auckland CBD office building owned by my company. The previous tenant had blocked off some of its window which we now intended putting back to the conventional shop front. “We were informed by a planner my Auckland office uses for council dealings (which can be laborious) that under the new council rules, changes to a building’s appearance require resource consent and we would be subject to penalty if we simply put back the window. “If that’s not outrageously absurd enough, things then became truly Kafkaesque. “For we were then told that we needed RMA approval (for a new shop window, for God’s sake) – this instantly forthcoming at a cost of $4,500 plus the approval of 13 iwi. “The council refused to advise the addresses of these iwi outfits, yet added that without their consent, we can’t put back the window. “So the planner located then wrote to the 13 iwi, ranging from Taranaki to Whangarei. “Five replied stating they had no concerns while others said they were considering the matter, presumably calling huis to weigh up this window crisis. “One respondent bearing that fine old Maori name of Jeff Lee, representing something called Ngai Tai Ki Tamaki, contacted the planner. “After advising the planners verbally that no Cultural Impact Assessment Report was required for the window, he nevertheless asked them to consider it – brace yourselves – given his ancestors, centuries ago, gathered in the vicinity. “Lee then wrote, outlining his terms for ‘assessing the window’s cultural impact’ which, he said, would take him ‘a total of six to eight hours’. In 2012 Nick Smith resigned from Cabinet, telling Parliament he was guilty of two errors of judgement: “I have tendered my resignation. I do so because I made not one error of judgment but two”. Nick Smith has now made two errors of judgement over the RMA. In spite of acknowledging publicly that “tinkering with the RMA won’t do”, his first error of judgement was to continue “tinkering” with the law, instead of putting it on hold – as Amy Adams had done – as soon as it became clear that he couldn’t gain support for proper reform from his coalition partners. Alternatively, he should have approached New Zealand First, who has offered to support proper RMA reform as long as all race-based provisions in the Bill are removed. His second error of judgement was to even think that inflicting the power-grabbing demands of Iwi Leaders onto the public is the right thing to do. The time has now come for the Prime Minister to exercise some leadership and either put Nick Smith’s Bill on hold, or alternatively take up New Zealand First’s offer for comprehensive RMA reform. Secondly, John Key should remove Nick Smith as Minister in his January Cabinet reshuffle, since it has now become clear that his judgement cannot be trusted. Should Nick Smith be removed as the Minister in charge of the RMA reforms? Nick Smith should be removed from the face of this earth. Like Geoffry Palmer before him. They have both done their best, to remove all one people one law democracy from our government. Why do you think john key wanted, so desperately, to remove the UNION JACK from our flag? Because it represents ONE PEOPLE UNDER BRITISH LAW. Where is John Minto when these apartheid laws are being passed? A.G.R.